Goldenrod, sweet goldenrod, also known as blue mountain tea, fills the countryside with golden yellow color as summer moves into its third act. These flowers are attractive sources of nectar for bees, flies, wasps, and butterflies. It plays host to many beneficial insects and repels pests. Most species are native to North America. Did you know that Thomas Edison studied goldenrod extensively in his search for native plants with rubber content? It seems he was asked to find a more “local” source of rubber for his friends, Henry Ford and Harvey Firestone. At that time, in the 1920’s, these entrepreneurs and automobile pioneers had to rely on tropical sources of rubber which could be a problem if strife hit those countries. Unfortunately, Thomas Edison could not extract enough rubber-like substance from goldenrod to make the endeavor worthwhile. Here is in this country Goldenrod was used by the Native Americans to treat wounds. The early settlers used it for several types of ailments as well. 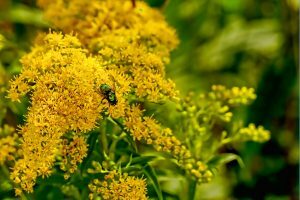 I make a salve using goldenrod flowers and leaves. Its one of several ingredients in my salve and I have a lot of testimonials for its effectiveness. Where Found: native to North America; one species, Solidago virgaurea is the only one native to Great Britain. Ragweed is wind-dispersed and makes it the likely culprit for hay fever. 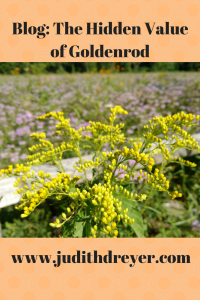 So many folks insist that goldenrod is the culprit for their hay fever allergies. Yet the seed patterns do not seem to support this claim. Whenever I take students on field walks I can usually find ragweed nearby, thriving next to goldenrods. Goldenrod and others support wildlife and diversity. Galls form on stems and when left alone after summer bloom, they can provide homes and food to other wildlife. Downy woodpeckers and Chickadees, in particular, search for galls for winter food. Many bugs form the galls for their young. When deadened stems are left in fields, they provide food for many. My podcast guest this week, Jane Seymour, describes and educates us on the role many meadow plants play in maintaining a holistic ecosystem. Meadows, fields demonstrate that many parts play a role in supporting the whole. Remember fields, whose appearance seems messy and haphazard, have a beneficial focus, most of which is hard to see. However, in my backyard meadow, I sit and listen to various bees create a hum that’s soothing on a hot summer’s day. I love the deep mustard yellows of goldenrods too, placed among the pinky purples of joe-pye weed and the purples of woodland asters as if some invisible impressionist painter stole in during the night. And, I watch the wildlife, the birds and other critters who hide out here. Food, shelter, habitat, goldenrod fulfills an invaluable service to our community. For without our plants and plant communities, our insects suffer. If they suffer then we will too. We are all connected by an invisible web and while mysterious and splendid, we have much to learn. Nature is here to teach us. We appreciate your comments. Please share. Thanks. Description: What is phytoremediation? It’s plant-based solutions to healing toxic spills on our land. Katrina, ‘Kat’ VanDuesen explains how our invaluable plants clean up toxic waste and contamination whether metals, radiation, oils and other contaminants. Serious health issues, as well as health issues within our soil, water, and air, are well documented from some of these very toxic spills. Ecological environmental applications work. Kat tells us how nature has solutions. About My Guest: Katrina. VanDeusen is an Environmental Scientist with over 20 years of broad-based professional experience in environmental applications developing multi-media remediation strategies for both public and private sector clients in the New York City metropolitan area. Her technical experience includes Phase I, Phase II Site Investigations, Preliminary Assessments, Ecological Evaluations, Remedial Investigation, Remedial Alternatives Analysis, Environmental Site Assessments, design of bioremediation systems, due diligence, legal support, wetland delineation, hydrology assessments, sensitive habitat multimedia sampling, community and habitat surveys, ecological engineering/restoration for both hazardous and non-hazardous sites. Ms. VanDeusen’s technical writing skills include Preliminary Assessment reports, Remedial Action Workplans and reports, Site Investigation and Remedial Investigation reports, NEPA reports, Phase I and Phase II technical reports, environmental liability assessments, Vapor Intrusion Reports, wetland delineation and ecological restoration reports. I cannot believe this is my 25th episode! I began with encouragement, an idea and a love. My friends encouraged me to get my ideas out. My family said its time for a podcast. And, I enjoy the interviewing format. So an idea was born, a plan formed and here I am today so excited to not only share this podcast series with you but my interview on Beyond50Radio. They have a green, environmental track as well as interview folks from all walks of life. They were a joy to work with. I cannot begin to tell you how satisfying it has been for me to interview. With our ever-growing, expanding and changing technology we can easily get more info out in easy-to-handle bytes based on our personal interests. 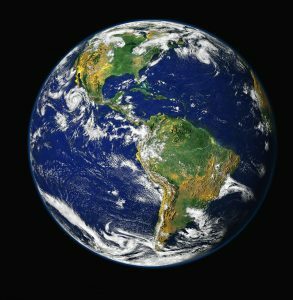 I have the pleasure and honor of talking to folks deeply passionate about our earth, ones who have offered simple yet timely tips we can use today. I thank you for your time and your sharing. I, like many of you, are deeply concerned about climate changes that seem to be shifting our ability to adjust. If it’s affecting us, then it affecting every element, blade of grass and species on this beautiful planet, we call home. If we could do one better recycling task today, reuse something today, give gratitude for every breath we take today, we will make a difference. The innovations I see says we are making changes, creating incredible solutions, from the ground up! I enjoy your comments. And appreciate you sharing these podcasts. I send each of you my heartfelt thanks. Podcast: Holistic Nature of Us: Meet Pam Montgomery, Founding Member of O.N.E. 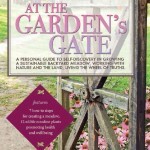 Description: Meet Pam Montgomery, author, teacher, and practitioner who works with plants and investigates plants/trees and their intelligent spiritual nature for more than three decades. She is a founding member of United Plant Savers and more recently the Organization of Nature Evolutionaries, O.N.E. She and others strive to connect the heart of nature with the heart of humanity. Join us for an engaging and enlightening discussion. All comments are appreciated. Please like and share. Thanks! About My guest: Pam Montgomery is an author, teacher, and practitioner who has passionately embraced her role as a spokesperson for the green beings and has been investigating plants/trees and their intelligent spiritual nature for more than three decades. She is the author of two books one of which is the highly acclaimed Plant Spirit Healing; A Guide to Working with Plant Consciousness and Partner Earth; A Spiritual Ecology. She operates the Partner Earth Education Center at Sweetwater Sanctuary in Danby, Vermont where classes, plant research, and ceremonies take place. Pam also teaches internationally on plant spirit healing, spiritual ecology and people as Nature Evolutionaries. She is a founding member of United Plant Savers and more recently the Organization of Nature Evolutionaries or O.N.E. Her latest passion is to engage ceremonially in full symbiosis within the plant/human matrix where the elder common plants and trees initiate and guide us into being truly human.